Dubai: Croatia defeated England 2-1 after extra-time to book their place in the Fifa World Cup final at Luzhniki Stadium in Moscow on Wednesday night and move into a showdown with France at the same venue on Sunday. Kieran Trippier struck after five minutes to give Gareth Southgate’s side the lead as they attempted to reach the showpiece match for the first time since they won the Jules Rimet trophy back in 1966. Ivan Perisic levelled for Croatia in the second half but neither side could find a winner in the regulation 90 minutes. 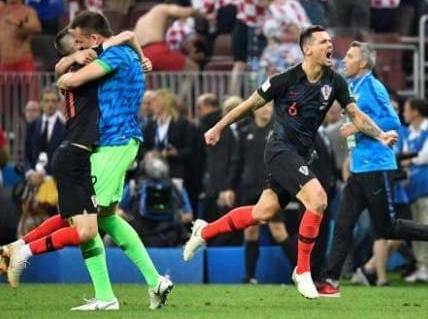 Then Mario Mandzukic struck the killer blow in the second half of extra-time to break English hearts and let the Croatian dream continue. Southgate opted for the same starting line-up that comfortably defeated Sweden in the quarter-finals, meaning he kept faith with frontman Raheem Sterling despite his poor goalscoring form of late. Croatia coach Zlatko Dalic made one change from the win over Russia, with Marcelo Brozovic coming in to replace Andrej Kramaric. After only three minutes, they were stunned as England got the perfect start. A flick from Jesse Lingard found Dele Alli who was fouled by Luka Modric just outside the area. Up stepped Trippier with the coolest of heads and he clipped it into the top corner, giving goalkeeper Danijel Subasic no chance with yet another set-piece goal. England were in the mood to kill the game off early and Harry Maguire almost made it two but his header went just wide. Croatia finally began to find their feet and Ivan Perisic flashed a shot into the side-netting of Jordan Pickford’s goal after 18 minutes. The play was flowing freely now and Harry Kane was freed by Sterling, but the tall England striker was a good three yards offside. Kane had another chance on the half-hour mark when the keeper saved his soft effort and his follow-up hit the post from two yards out and then blocked by Subasic. It was still end-to-end and Pickford had to make a good save from Ante Rebic before Jesse Lingard scuffed wide from a promising position. The Croats knew time was against them as Rebic vented his frustrations at a teammate as a slack pass went out of play. England could have had a vital second goal when Trippier’s volleyed cross was just cut out before it could reach a diving Kane head. The Eastern Europeans responded and John Stones had to clear a dangerous Modric cross before Perisic’s powerful effort was bravely blocked by Walker. The Croatia pressure was building and they finally broke the England rearguard after 68 minutes. Sime Vrsaljko whipped in a brilliant ball and Perisic got away from Trippier and Walker and got a toe on the ball to turn it into the net. Dalic’s men had their tails up and were pinning England back as the looked for a winner, Perisic hitting the post and England visibly tiring. Southgate threw on Marcus Ashford for Sterling as he tried to freshen things up. The Manchester United man looked like he had a point to prove and the Croatan defence had to be alert to clear his dangerous cross. Mandzukic should have got the winner with nine minutes left when he got free inside the area, but he shot straight at Pickford. So, into extra-time we went — for the third match in a row for Croatia — and there were plenty of tired legs on both sides now. Ivan Strinic had to go off with a thigh strain for Croatia with Josip Pivaric replacing him. Eric Dier came on for Jordan Henderson as England were starting to press once more. Stones thought he had scored but his header was cleared of the line by Vrsaljko. There was still more drama before the change of ends as Pickford had to be alert to save from Mandzukic as he looked good to score. He made no mistake after the break as Walker failed to clear from the edge of the area and Stones could only watch and Mandzukic powered home past Pickford for the winner. Croatia’s reward: A place in the final. England will have to comfort themselves with a third-fourth play-off against Belgium on Saturday.